With it's smooth, silky texture and delicate, sometimes complex flavors, cheesecake may seem daunting but doesn't need to be. There are three kinds of cake pans you can use to make cheesecake. 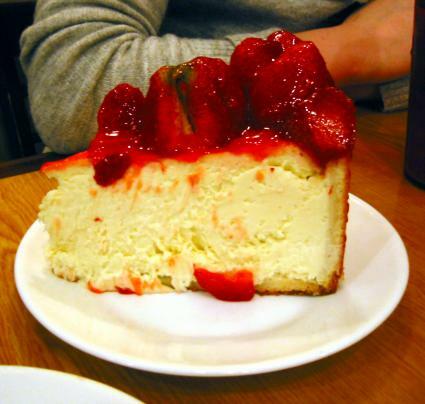 Unlike other cakes, cheesecake is more like a custard than a regular cake. It usually turns out better if you use a water bath to cook it, so we are going to be concerned with leaking. The spring-form pan is a pan that has a removable side. The side clamps around the bottom by using a spring clip that pulls the side tight. They leak. They all leak. Even the ones that say they don't leak, leak. There is a way around this problem, but the best way to avoid the leaking is not to use a spring-form pan for cheesecake. Spring-form pans are good for some things, just not cakes that need to go in a water bath. If you are new to baking, odds are that you don't have a spring-form pan and unless you find yourself needing one rather often, I would recommend giving this a miss. False bottom pans...leak. This is a pan that has a bottom that can be removed by pushing it up. This is a really useful type of pan. It makes removing baked goods from the pan incredibly easy. They, too, will leak and are often worse than the spring-form. But, there is a way around this. Regular pans. These are good, solid cake pans with no snazzy tricks or snappy bits to them. Since they are usually made from a solid sheet of metal, they do not leak. And since we are going to be cooking our cheesecake in a water bath, we want a pan that will not leak. But, cheesecakes have a tendency to stick to the sides of the pans they are cooked in; this is why people use spring-form pans. But, there is a way around the sticking. Plastic wrap. Yes, plastic wrap. Go to your local cooking supply store and get a nice big roll of heavy-duty plastic wrap. If you don't have a restaurant supply store, go to the local market and get the heavy-duty stuff. Now, assemble your cake pan if it needs assembling. Spray the bottom and sides with water and line the inside of the pan with the plastic wrap. Give plastic wrap lining the pan a quick shot of non-stick spray. Now, you are ready for the cake. There are two parts to this particular cheesecake recipe. The crust and the cake. This recipe makes one 6-inch cake. If your cake pan is larger, you will have to increase the amounts for the batter and crust. The usual cake pan size is 9-inches, so you can just half-again the recipe. Mix these all together in whatever manner you prefer. I like to just use my hands and mush them until they are well mixed. Then, press the crust mix into the bottom of the pan and pack it down firmly. Bake for two or three minutes. That's all...just a real fast in and then out for the crust. Put the cream cheese in the bowl of your stand mixer and, using the paddle attachment, beat it until it is soft. Then, add the sugar and mix well. Scrape down the sides of the bowl. Add the egg yolks and mix well. Again, scrape down the sides of the bowl. Add the cream, vanilla, and lemon zest and beat until the mixture is very, very smooth. Pour the cake mixture into the cake pan. Find a baking pan that will hold your cake pan and put the cake pan into it. Pour water into the baking pan until it comes about halfway up the sides of the cake pan(some people find it easier to put the baking pan/cake pan combo into the oven first and then pour the water into the baking pan). Put the whole set into your oven and bake for an hour. Turn off the oven and let the cake sit for another hour. Next, take the cake pan out of the water and put it in the refrigerator. Let it chill for at least an hour or so. Overnight if possible. Finally, just turn the cake out of the pan. There you go...a cheesecake. Try this recipe a few times and you will be ready to move on to adding more flavors to the cake. If you feel so inclined, you can take some raspberry jam and strain out the seeds. Then, put the seedless jam into a piping bag and pipe a spiral from the center of the cake to the edge before cooking. Note: if you want to use a springform pan, you can tightly cover the outside of it with aluminum foil before using it. This will keep water from entering it.